Several things you can count on during your visit to the CMA Music Festival in Nashville, TN. It will be HOT, You will do a lot of walking/standing, and you are likely to see a thunderstorm or two pop-up during your stay. Below are some things you should have or do. Autograph book/CD covers (leave the CDs at home), photos of where you met the stars before, etc. Below, you can find items that will come in handy during you trip to Nashville for the CMA Country Music Festival. ​Click on the images to purchase your items prior to your trip so you want be running around trying to find them when you get there. It would be nearly impossible to list all possible phone cables for the large numbers of models available. The following link will take you to a list of all charging cell phone cables offered by Amazon. Always have a sharpie on hand. You never know who you will run into or where. I like to use a sketch book to collect autographs. That way, I can have the artist autograph one page and put our picture together (in scrapbook fashion) on the facing page. ​Two other items I always have on hand are the stiff plastic sleeves for inserting pictures I collect during the week so they don't get bent and post tubes. Many fan clubs give out pre-signed posters at their parties. You will be glad for the tubes by the end of the week. Don't forget to download the music of you favorite artists before you go. Then come back here to download music by new artists you may have discovered during you trip to CMA Music Festival and Nashville, TN. ​Purchase made using this link help to keep this site up and running. Thank you for your support in this effort. You can use the interactive search below. Park it Downtown has information on 177 lots and 32,000+ parking spaces in and around downtown Nashville. ​Keep in mind that during certain events, such as the CMT Awards, certain lots may be reserved for staff and television crews. ​Also, during this time, some of the lots may not be accessible due to road closures especially along Broadway between 1st Avenue and 5th Avenue. ​This site also provides a search function for your convenience. ​Visit: ParkitDowntown.com for more details. Music City Circuit is a FREE bus shuttle service for the downtown Nashville area. It is a great way to get from one end of town to the other efficiently. The Music City Circuit serves many downtown destinations including Bridgestone Arena, Schermerhorn Symphony Center, Ryman Auditorium, Tennessee Performing Arts Center (TPAC), Farmers' Market, Country Music Hall of Fame, First Tennessee Park, Historic Second Avenue, Frist Center for the Visual Arts, Bicentennial Mall, Gulch bars and restaurants, downtown hotels and other downtown attractions and landmarks. Circuit buses traveling on the Blue and Green Circuits operate every seven to eight minutes between 11 a.m. and 7 p.m. and every 15 minutes after 7 p.m. along 4th and 5th Avenues to and from Demonbreun Street and the Bicentennial Mall area. On weekends, the Blue and Green Circuits operate every 15 minutes from 11 a.m. to 7 p.m. and every 30 minutes from 7 p.m. to 11 p.m. The Purple Circuit operates every 15 minutes on weekdays. ​Visit the Music City Circuit WEBSITE for more information. 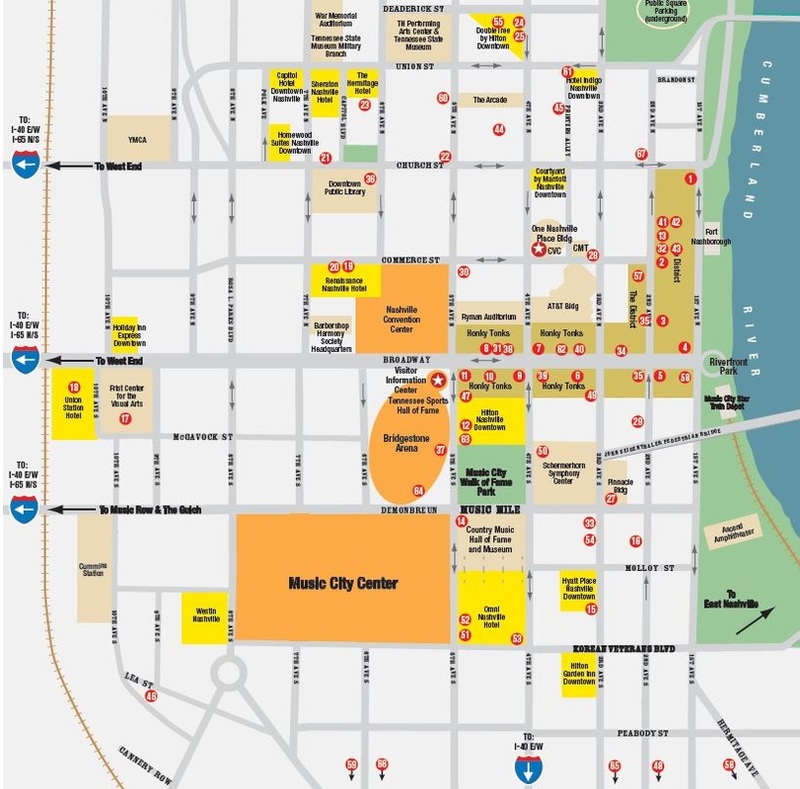 The Country Music Association has put together a nice map of dining options in and around the downtown area of Nashville. See their MAP on the official CMA Festival Website. ​Some of these restaurants will take reservations thru their own sites or thru Open Table. Camera attachments, tripods, monopods, etc. ​CMA Music Festival reserves the right to refuse admittance (with refund of admission) to ticket holders who refuse to allow inspection of their purse/package when entering each venue. The Stadium is the ONLY area that will have storage lockers available at the Festival (more details coming soon). All other areas/stages do NOT have check-in services or storage lockers available.